Gary Franklin vowed to work until he could work no longer, after he was diagnosed with MS.
Gary Franklin is one of Z Energy's longest-serving employees. He uses a wheelchair to get around, but props himself up on a stick or the counter for the length of his shift. More than 14 years ago, Gary Franklin​ walked in to his GP with a hernia and left with a multiple sclerosis diagnosis. The long-serving employee of Z Energy, and formerly Shell, vowed to keep working. "I just looked forward and thought I would just keep going to work until I can't," Franklin said. As his condition deteriorated, to the point he could no longer walk unsupported, Franklin moved in to a customer service role at the Shirley site. Franklin, 53, is still able to drive and uses a wheelchair to get to and from the car park. Once behind the till, he stands all day and uses the counter as support. 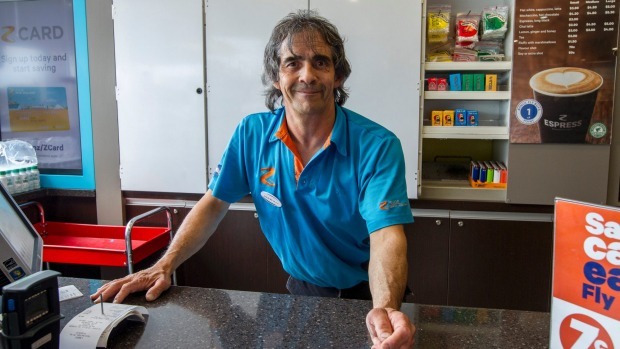 Hattrick Services operations manager Anton Hutton said Franklin, who had clocked up 35 years with the company across different Shell and Z retailers and under various management, was a "local legend". He had started at a Woolston site some years ago and Hutton was still fielding his mail. "Come Christmas time, I have to deliver his Christmas post that gets sent to that site every year. If he is ever away sick, you spend half your day answering the 'where is Gary question'." Franklin had known many of his customers since they were children. "He is a quintessential part of the community and he's been that long in customer service he's just become part of people's lives," Hutton said. Franklin worked full time and arrived an hour early to his shift each day, he said. "He gives our grave-yarder a hand . . . he will sit down and read the paper on the floor out the back and he will make sure everyone is organised." Franklin was renowned for his "devilish sense of humour". "Gotta keep them on their toes," he said. Only recently did a colleague realise the greenery he had been asked to water every day on the forecourt was plastic. "With Gary, we know that no matter what, the store is in good hands," Hutton said. He said he did not employ people to tick all the boxes and to boost the company's image. He simply hired the best people for the job. "Hire people because of their ability and their possibility. If you're doing it as a social service, don't." He worked closely with the Ministry of Social Development and Workbridge to support a number of people, who had varying physical, intellectual and social disabilities. "The biggest thing for people is just looking inside that pool of employees because as Christchurch grows in particular, with hotels and convention centres, to get great staff you're going to have to learn to throw your net pretty wide.